Greetings from West 8th Street! 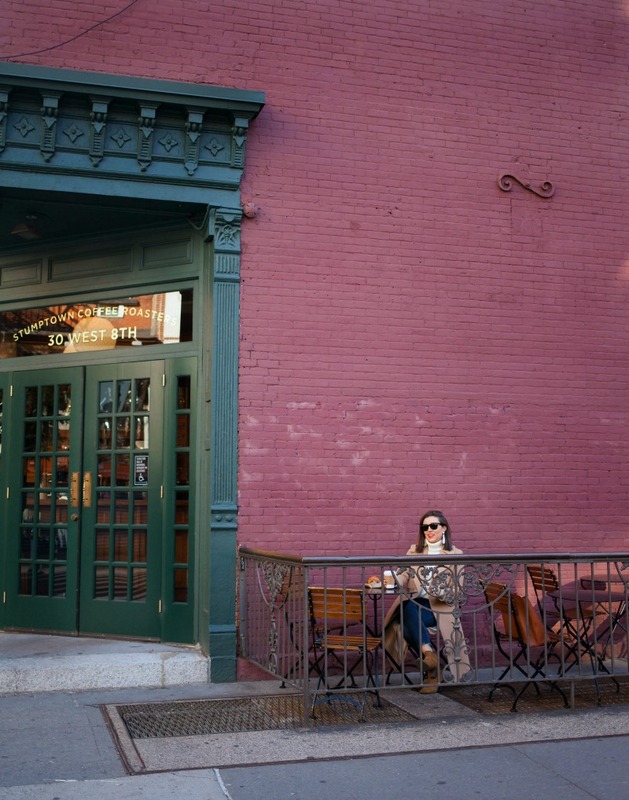 The red brick and green entryway here at Stumptown Coffee feels positively festive, but if you can believe it, we're still having days when it's warm enough to grab a coffee and a croissant and enjoy it outside. All that's needed to last more than a few minutes? A great coat, of course. 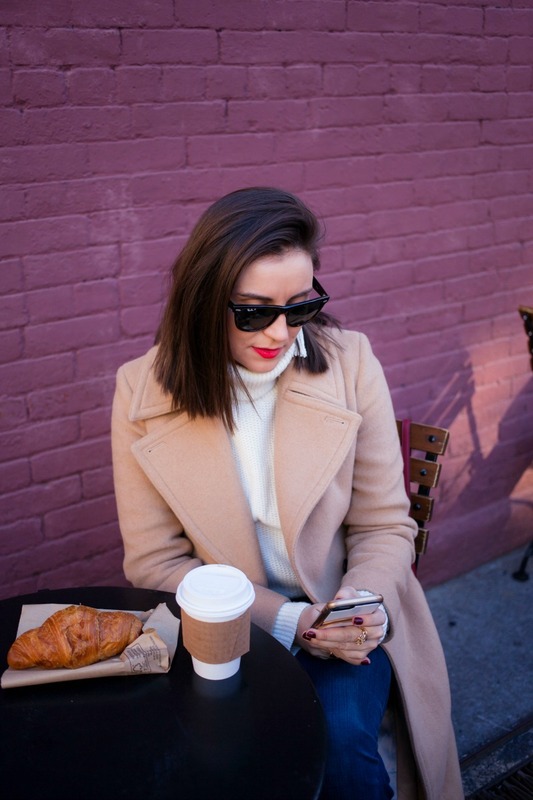 For me—and this will come as no shocker to those who have been reading the ol' blog for a while—it doesn't get better, warmer or more wearable than my Club Monaco Daylina coat. I bought it last fall, and I must not have been the only one, because CM has brought it back again this year. I won't bore you again with how much I love it, but just know that this one is the real deal. I put this little red Cuyana bag in my most recent gift guide, and it's quickly become one of my favorite things. The brand sent it to me as part of their "Give, Better" holiday campaign; I love their whole ethos around the holidays (and all the time) that revolves around giving fewer gifts of a higher quality and with a more personal feel. A red bag is one of those "pop of color" elements (to use a trite fashion phrase) that I never knew I needed. I wear to many muted neutrals like black, grey and camel this time of year, that this little surprise of scarlet does a lot to make every outfit feel a little more festive. 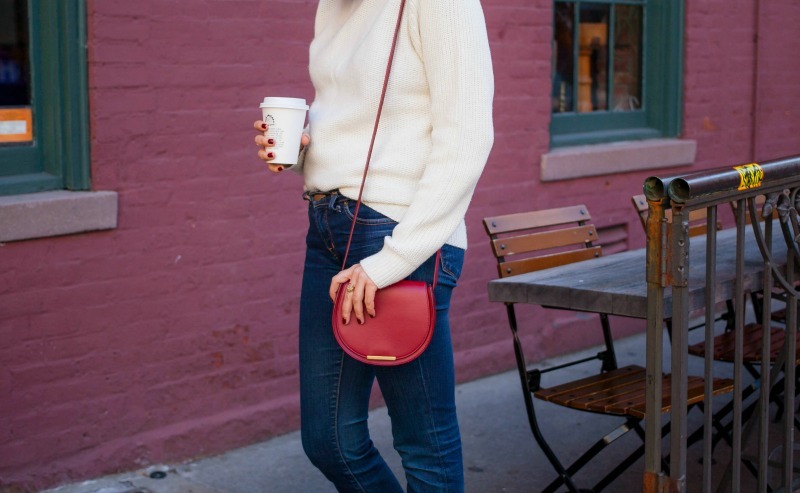 If you're looking for some other options, I love this little red velvet bag from Rebecca Minkoff ($145), this baby Michael Kors bag in burgundy ($124), and this Rider bag from J.Crew ($98). The last thing I ever want my sweaters to be is too tight. In fact, I really prefer them a bit oversized, which is why I often shop in the men's section of some of my favorite stores, in order to find that perfectly slouchy fit. Uniqlo especially, since their cuts for men are rather slim, has a lot of great knit options. I'm particularly smitten with this turtleneck, and I think I may need to grab it in a couple more colors before heading to Sun Valley for the holidays. Online it's currently sold out in every color except grey, so check your local store for more sizes and colors. Also, I should note that these J Brand jeans are about eight years old. I dug them out of storage a few months back and decided they deserved a second chance. The original hem was a very 2008 not-quite-skinny, so I hacked off about four inches in the back and five in the front—creating that oh-so-trendy uneven hem. 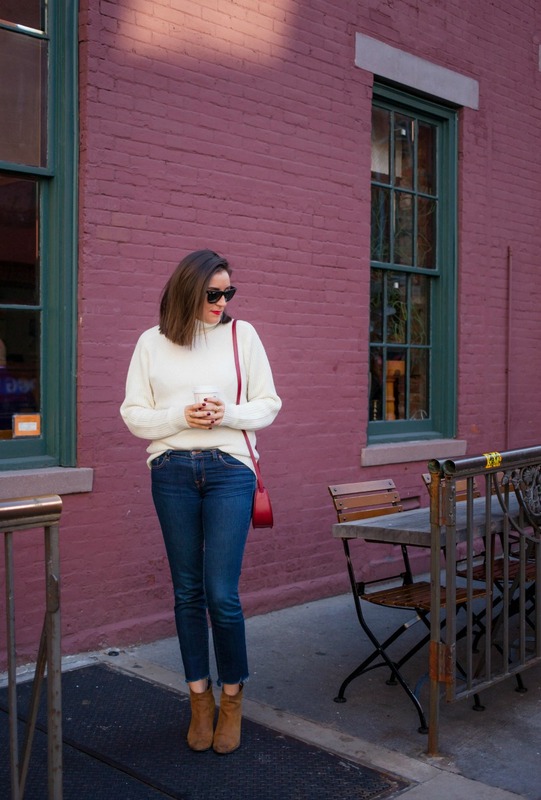 I've now brought these revamped jeans into heavy rotation for a very on-trend look, for free! I really should need to attempt look at your blog one day earlier! A debt of gratitude is in order for sharing here. I am cheerful to see this information. I basically welcome you for that kind of effort. I simply welcome you and keep posting a few. I am so awed. I think you have a remarkable adapting especially while dealings with such subjects.Feel cheap essay writing services . Training contains various endeavors like article, errand, look at paper composing and an extensive part of the understudies can't complete their task adequately inside the time.